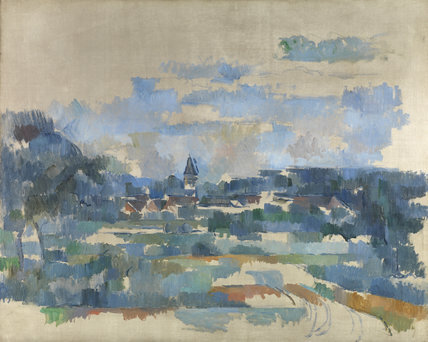 This large landscape by Cézanne shows a view of a village across an almost abstract pattern of fields and trees. The turning road in the painting’s title winds through the landscape and takes the viewer from the foreground to the roofs and steeple in the distance. Cézanne left areas of the canvas unpainted and integrated them into his composition. Such rejection of academic rules contributed to Cézanne’s posthumous status as the “father of modernism” among avant-garde artists of the early twentieth century.